I read an email today letting people know that one of my favourite tanker-and-pipeline films is newly available to stream for free online. Frank Wolf unofficially debuted “On the Line” in Bella Bella in May 2010 when we hosted an arts event called the Gathering Coastal Voices Festival. We had an amazing lineup of speakers, art exhibitions, live music, incredible seafood, and a multi-venue film festival to raise awareness about the threats posed by the Enbridge pipeline and increased tanker traffic on the coast. Three and a half years later, there’s an impressive array of artistic protest and multimedia storytelling to voice our opposition. Thinking back to Gathering Coastal Voices made me realize just how diverse that list would be. So I thought I’d share some of my favourites! 1. Groundswell: A Small Film about Making a Big Stand. We all have a responsibility to advocate for the places we love, and those marine mammals who have a voice – crazy surfers included – have a unique opportunity to be a voice for the marine mammals that can’t speak for themselves. You can watch the trailer here, or stream/download the full film here (all proceeds support Raincoast Conservation Foundation). 2. Black Wave: The Legacy of the Exxon Valdez. The first time I watched this film, I wept. And the first time I heard Dr. Ricki Ott speak in person, I felt empowered by the knowledge that the survivors of this disaster are fighting at our side to help prevent this from happening on the BC coast. You can watch a clip or buy the DVD here. 3. On the Line. We hear a lot about the proposed pipeline route, the hazards, the streams it crosses. See it for yourself through the eyes of two amazingly spirited men who traversed the 2,400 km. on foot, by bicycle, and by watercraft. You can stream it for free here, and find a link to their TEDx talk about the project. 4. Stand and StandUp4GreatBear. When Norm Hann traveled the length of the proposed tanker route on his stand-up paddleboard, his arrival in Bella Bella inspired our youth so much that two woodshop classes at our local high school made their own wooden SUPs. These two films tell a pretty incredible story. You can watch the Stand trailer here and purchase the DVD, and watch StandUp4GreatBear here. 5. Petropolis. It’s hard to understand how overwhelmingly huge and devastated the Tar Sands in Northern Alberta really are. Greenpeace gives you a window in with Petropolis. Short of being there for yourself and feeling the grit in your teeth (which I don’t recommend), this film can at least give you an aerial view that brings the visuals home in a very visceral way. You can watch the trailer here, or learn more about the film here. 6. Reflections: Art for an Oil-free Coast. In the summer of 2012, Raincoast Conservation Foundation brought 50 incredible BC artists into the heart of the Great Bear Rainforest to capture some of the magic of this place. I was privileged to meet them and spend time with them, and contribute to the book project that came out of the trips. Watch Reflections and see the deep connections between art and politics; there is beauty in dissent. You can watch Reflections online here, and learn more about the book here. 7. SpOil, Oil in Eden, Cetaceans of the Great Bear Rainforest and Tipping Barrels. This quartet from Pacific Wild looks at Enbridge Northern Gateway from a variety of angles. SpOil looks at the pipelines and tankers through the lens (no pun intended) of world-class photographers, while Oil in Eden gives a powerful bird’s eye view. Cetaceans of the GBR is an engaging animation I’ve often used in school presentations that explores potential impacts on marine mammals. And Tipping Barrels is another view from the surfboard. See them all for free! You can watch SpOil here, watch Oil in Eden here, watch Cetaceans of the GBR here and watch Tipping Barrels here. 8. From Tar Sands to Tankers: The Battle to Stop Enbridge. This is another good bird’s eye view of the issue. It’ll give you some quick insight into the project, its potential ramifications, and the First Nations and environmental opposition. 9. Your Voice, Our Future. 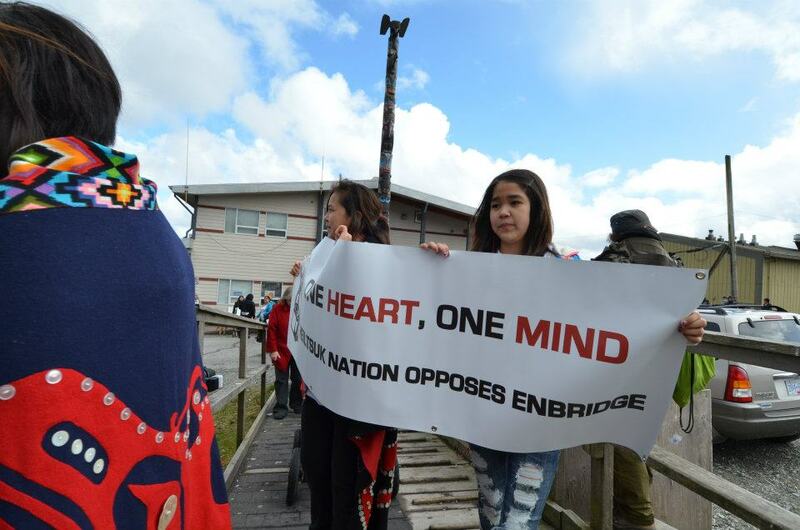 First Nations opposition to Enbridge Northern Gateway has been monumental. But not many of the films available to date are told in a strong First Nations voice from a deep, rich cultural perspective. Gaiasixa to the Wet’suwet’en for bringing that to the forefront with this film. It will move you. 10. BC’s Huge Gamble. This is another great short piece on Northern Gateway, this one by Corey Ogilvie. It opens with a quote from Emily Carr: “There are no words, no paints to express all this, only a beautiful dumbness in the soul, life speaking to life.” Anyone’s who’s been to the coast will know that the majesty Carr points to in this quote absolutely lives here in the GBR. Janet and the Orca, an animated Dan Murphy spoof based on a leaked TV script for a canceled Enbridge ad. Building a Butter Pipeline, for anyone nauseated by the new “Open to Better” TV ads Enbridge is running right now. LaMar’s Tar Sands Souvenir Stand!, because Canada is NOT just a place full of polar bears. Call the Tar Sands Love Line, for anyone worried about fallow pipeline tubes. Tar Sandz Pimpin’, because who doesn’t love rapping puppets? and the ever-popular Weathergirl Goes Rogue, which is an entirely appropriate reaction to climate change in my books. Now, I know I’ve missed a ton of great films and short videos, and I know there are also amazing poems, books, music, art, journalism and more that I haven’t even touched. Leave your favourites in the comments and I’ll happily share round-ups of other creative work in the future! Sometimes, when you’re in immersed in an issue or a fight that’s exponentially bigger than you are, it’s hard to stay grounded. When the goalposts keep moving, it’s difficult to measure your progress. You never lose hope, but sometimes, you lose a little bit of heart. And sometimes, good people demonstrate the generosity of their spirits and give you a little bit of their own heart instead, and all of a sudden things just seem clearer and brighter. I sat down this morning with a cup of coffee to start opening up yesterday’s mail. I had a pile eight inches high of envelopes containing documents filed recently within the Joint Review process for Enbridge Northern Gateway. I was reading through motions and evidence put forward by our allies, and responses from Enbridge that made my skin crawl. 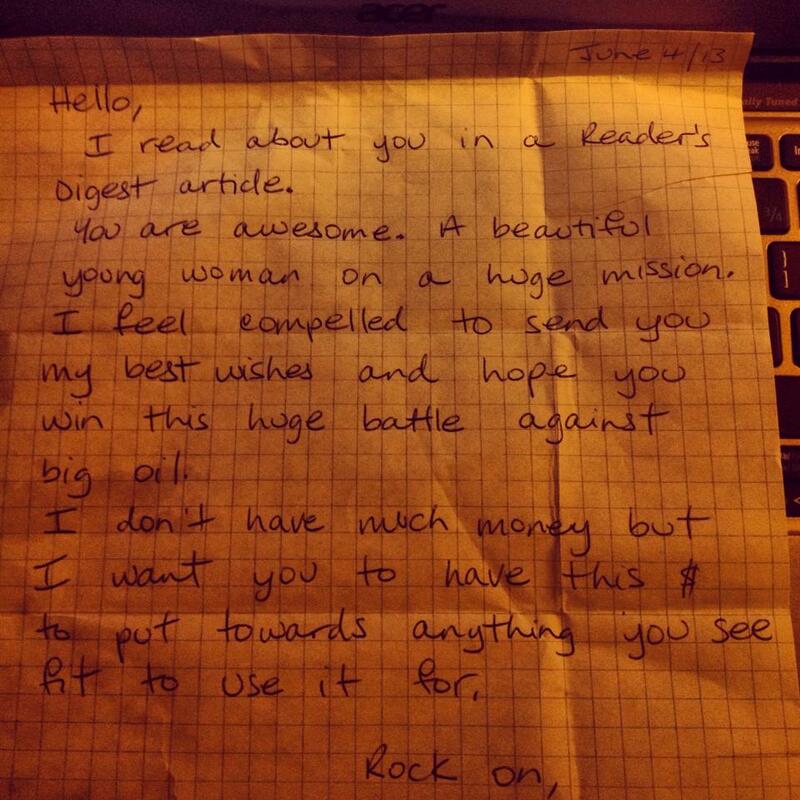 To the sender, who posted this amazing note to me in Bella Bella: You gave me my heart back this morning. You are a reminder of the legions of truly good people who are building a positive community to support the change that needs to happen in our world. And you’ve inspired me. In 2012, one of my first council activities outside my community was a visit to Fort McMurray to attend the Tar Sands Healing Walk. It was one of the most powerful, beautiful and challenging experiences of my life, and I blogged about it here. I was honoured to receive an invitation from the Keepers of the Athabasca to attend the Tar Sands Healing Walk again in 2013, and received permission from our leadership today to walk in solidarity on behalf of Heiltsuk this July. There is grassroots and place-based power, and there are local issues that affect our community and territory. But we have brothers and sisters across the coast, the province, the country and this beautiful planet who have their own power too. Together, what we wield has an incredible ability to speak and heal. I am pleased, proud, and deeply humbled by the opportunity to walk with the spirit of my people behind me to bring messages of healing, strength and collaboration to this important gathering. As our community has found its voice around energy issues, our guiding value has held us steady: Mnukvs wuaxdi. One heart. I will be bringing my love and the love of my people in July, and I’m honoured to be one messenger on behalf of many. Walas gaiasixa to the Keepers of the Athabasca for honouring me with an invitation. 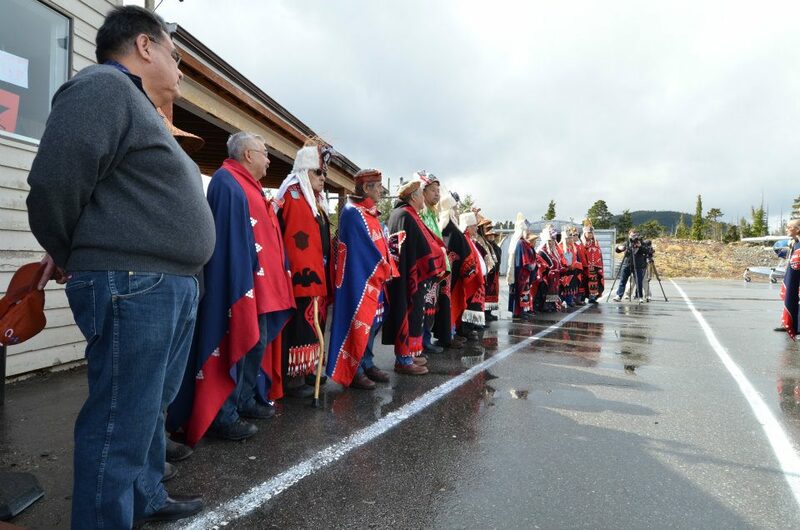 One year ago today, I was standing on the tarmac of the Bella Bella airport, a half-step behind a line of hereditary chiefs in their traditional regalia. It was the day before our JRP hearings were set to begin, and the sched flight that was about to touch down was carrying the JRP panel members, Enbridge attorneys, allies to the Heiltsuk, witnesses speaking for our Nation, and our High Chief Woyala who was coming home to stand with his people. It was the culmination of a huge planning effort driven by our whole community. As I stood behind our chiefs, I remember thinking how the community had grown around the issue from the first moment we heard rumblings around Enbridge Northern Gateway. The momentum had built and it was strong. As a community, we were prepared to stand up with dignity and integrity to be witnesses for the lands and waters that sustained our ancestors – that sustain us – that we believe should sustain our future generations. As the plane landed on the airstrip, I could hear the noisemakers on the chiefs’ regalia rattling. Our Heiltsuk singers and drummers were on the other side of the chain-link fence and their voices were so powerful I felt the ache of that pride right in my marrow. Our youth, elders, and families were clustered behind them, grasping signs and banners, four generations of our people standing together seeking some expression for their deep fears over a proposed project that threatened 10,000 years of culture and nature integral to our identity as Heiltsuk people. On a deeply personal level, I felt overwhelmed at that moment by the privilege of standing behind our chiefs on the tarmac. Those of you who know me know that I’m a shy person. I love to work hard, but I prefer to do it without fanfare. It took an issue like tankers and pipelines to make me realize that sometimes, the challenges you face are too big to let your personal fears limit your contribution to the fight. Enbridge catapulted me into an unexpected leadership position that created an incredible opportunity for me to be a voice and a force for the things I care about. At that time, I was one day away from filing papers to accept my nomination to run for Heiltsuk Tribal Council, and I was surrounded by a community of Heiltsuk people and their allies who had signalled huge trust in me with the work they’d given me in preparing for our hearings. I remember the plane landing, and the slow taxi of the aircraft toward the airport building and the line of hereditary chiefs. I remember the singers’ voices swelling, and the sound of the chiefs’ rattles. I remember the plane door opening, the ladder dropping down. I remember our High Chief Woyala’s head and shoulders emerging from the interior of the plane, the look on his face when he saw his fellow chiefs waiting to greet him and all the other passengers – friend or foe – en route to the hearings. I remember his tears and his evident pride as he danced down the steps and across the tarmac to stand with his people. And I remember realizing that I was crying too, completely overtaken by the power and dignity of the people around me. The gathering of the crowd, the dressing of the chiefs, the wait for the plane’s arrival all happened in slow motion for me. What came next was a blur. We’d made arrangements to greet the plane in the Heiltsuk way – to honour the passengers with a welcome dance from the chiefs and an invitation to feast with us that night. It was of importance that we do things according to our sacred customs and protocols – that we do things with honour in the Heiltsuk way. As the welcome dance ended and Woyala began his address to everyone gathered there – intended for community members, neighbouring First Nations, environmental allies, JRP panel members and Enbridge representatives alike – a small huddle of people darted from the plane past the chiefs, through the small airport building, and into a waiting taxi. Many of you already know the story of what came next. The sound of a community member knocking on the window of the taxi and holding up a sign was reported as “possible gunshots”. The children and families lining the road with signs were painted as a dangerous mob. At the feast that night, which the panel members declined to attend, Heiltsuk leadership received an email notifying them that the hearings had been cancelled. The panel members and staff said they feared for their personal safety in the face of the day’s events. When our elected Chief Councillor Marilyn Slett stood up before the community at the feast that night to read out the cancellation message, you could feel the weight of those words like a physical impact. We had done everything according to our teachings, and to feel the back of someone’s hand could hardly have been more of an insult. Do I want to belabour that now? No, I don’t. Because in a sense, it’s the least interesting thing that happened that week. We could have let that decision by the JRP settle like poison in our bodies. But what we chose instead continues to be the greatest source of strength and inspiration I’ve seen in my own life. What happened was nation building. What happened was community building. Maybe it felt different if you weren’t here. We were isolated, and people were trying to shame us for our actions. For an instant, that fear made me vulnerable. But when I looked around me at all the people gathered at that feast, the fear turned to gratitude and the gratitude made me strong. Why was it nation building? The room was full of Heiltsuk people who had just been insulted for practicing their culture and adhering to their traditional values and practices. And when they had to choose their response, I am proud that they refused to accept the shame and anger being pushed on us. The room was filled with community members who collectively asserted that the integrity of our cultural identity is the root of our strength as a people. At no point were we willing to apologize for upholding our traditions and acting with the peace and dignity inherent in our cultural protocols. Why was it community building? We had neighbouring Nations standing with us – Gitga’at, Kitasoo-Xaixais, Nuxalk and Wuikinuxv. We had regional leaders from First Nations Summit and the Union of BC Indian Chiefs, allies from the Lubicon Cree. We had friends in the environmental community from Raincoast Conservation Foundation, Sierra Club BC, Greenpeace Canada, Pacific Wild. Our MLA was in attendance. We were blessed by their presence. And one by one, they stood up to address our Heiltsuk people. The power of their voices made us more resilient as they asserted that they’d witnessed our words and actions, and upheld that they were spoken and done with honour. The power of our friends and our leaders gave us the guidance we needed to move through the coming days. It’s been a year since that day. I remember the chaos of trying to get the hearings back on track, the frustration of losing 1.5 days of testimony from our elders and knowledge-keepers. I remember sitting in the back of the room at the hearings, fighting to stay composed when our elders walked off the stand in protest – their evidence undelivered – after needless heckling and interruptions. Funnily enough, I remember my phone crashing as it tried to load the notifications for all the messages being sent to me by strangers around the world who were using social media to stand with us in that little auditorium. Some of my dearest friends today were strangers a year ago and I’ve never stopped being grateful for that first time they reached out. The words that come into my mind when I think about a year ago aren’t dark. I remember gratitude, dignity, strength, resilience and grace. The images are the same. I remember the power of the testimony unfolding in front of a sea of red armbands, a packed room expressing silent solidarity with the witnesses who were speaking. There was a lot of beauty in that week, and it’ll be an inspiration to me for as long as I live. I also have a huge amount of personal gratitude for the role I was given in all those proceedings. One year has passed by. I’m eleven months into my first term on Heiltsuk Tribal Council. I still get pulled aside in the street by chiefs, elders, community members, children. They ask the questions, express the concerns, and give me the direction I need to uphold the privilege of working for my people – both in my political work, and in my community organizing. I’m surrounded by friends who came into my life in a time that would have been more difficult if not for the amazing wonder of new beginnings that they represented to me. I live in a place where the water in the rivers isn’t different from the blood in our Heiltsuk veins, where we’re surrounded by the bounty that’s sustained our people since time before memory. And we’ve never forgotten the honour and obligation of stewarding it. All those things were blessings, and they’re still blessings today. It taught me important lessons about vulnerability and fear – about sovereignty and governance – about unity and beauty. It was positive, and it was transformative, and I am profoundly grateful. Thank you for being a part of transforming me.